You've decided to pack-up your digital photo library and make the big move from iPhoto '09 to Aperture 3. Luckily, if you're using the latest versions of both applications, the transition has never been easier. iPhoto '09 integration is one of the many improvements added to Aperture 3. 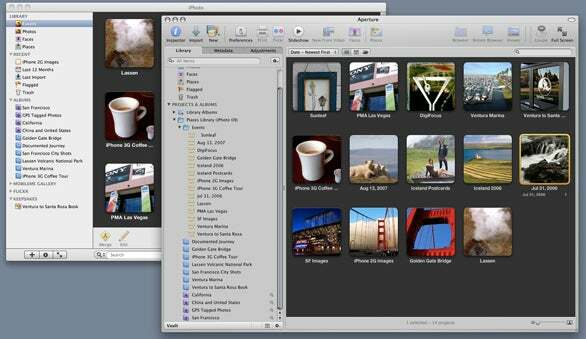 With a little planning, you can migrate your iPhoto library quickly and easily. Why move to Aperture 3? Aperture 3's prowess is apparent at every point in the digital photography workflow. The two areas that I‘ve found it the most impressive are image editing and organization. After you've experienced localized retouching with Aperture's brushes, or saved your best combination of settings as presets, you'll have a hard time going back to iPhoto's simple Adjust palette, which suddenly looks barren compared to Aperture's Adjustment Inspector. Then there's Aperture's robust, project-based file-management system, which provides impressive flexibility and organizational powers, regardless of how many images you throw at it. And the best part is, the Aperture interface has been simplified so you get all of this power in a friendly, iPhoto-like environment. Does that mean that Aperture is for everyone? Certainly not. If you're using iPhoto now and are comfortable with how you're able to organize and correct your images, you can stay right where your are. Aperture 3 is for those who are feeling constrained by iPhoto's tools and are ready for more powerful image editing controls and flexible file management. 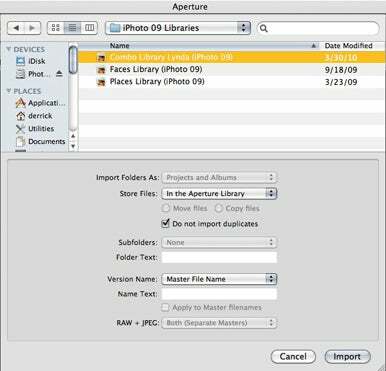 The easiest way to transition from iPhoto '09 to Aperture 3 is to use the Import iPhoto Library command in Aperture. In Aperture, go to File -> Import -> iPhoto Library. You can move your iPhoto images into an existing Aperture Library, but since it's so easy to switch from one Aperture library to another on the fly (File -> Switch to Library), consider setting up a separate Aperture library for your iPhoto work. It's easy to merge libraries later on if you decide that's what you want. To set up a separate library in Aperture, go to File -> Switch to Library -> Other/New. In the dialog box that follows, click on the Create New button, and select the location for your library. To keep things simple, you may want to use your Pictures folder. Once you have a new Aperture library, go back to File -> Import -> iPhoto Library. In the dialog box that follows, navigate to the iPhoto library that you want to import. Next, in the Store Files pop-up menu, I recommend that you select "In their current location." This points Aperture to your existing iPhoto library so you don't have to import copies of all your iPhoto images into Aperture. Using this method, you can continue to view your work in iPhoto, and have all the privileges of Aperture too. If you plan on keeping iPhoto for calendars, greeting cards, or simplified slideshows, you might want to use this referenced approach to keep your options open. Neither application will alter the master images stored in the iPhoto library. That means that any edits you make to an image in one program will remain there and not be visible in the other application. If you don't plan on using iPhoto for these images again, you can go ahead and move all of the masters into the Aperture library. After you go to File -> Import -> iPhoto Library and choose the library you want to import, select "In the Aperture library" as the destination from the Store Files pop-up menu. Alternatively, you can choose another location, such as an external hard drive, by selecting "Choose" from this menu. If you go this route, your masters will be stored outside the Aperture library, and Aperture will refer to those pictures as needed. You have a few other options in this dialog box. I recommend that you check the box next to "Do not import duplicates," just in case you already have the same image in Aperture. You can also customize the version file names for your pictures on import by using one of the presets in the Version Name pop-up menu. It's a good idea to use this option for smaller, individual imports, but when bringing in an entire iPhoto library, you might want to leave this setting at Master File Name to retain the existing file names. Finally, if you have RAW+JPEG sets in your iPhoto library, you can choose to bring in both versions, just the RAW files, or just the JPEG files. If you bring in both, you have a few more options: You can have Aperture use the RAW as the master file, or the JPEG, or bring in both as separate masters. I recommend that you bring in both using the RAW as master. That will make for a better image editing experience in Aperture. Once you've made your decisions, click the Import button, and Aperture will take it from there. Keep in mind that if you're importing a very large iPhoto library, this process can take hours. So plan your day (or night) accordingly. A side-by-side comparison of iPhoto '09 and Aperture 3.
iPhoto '09 users who invested time organizing their library using Events, Smart Albums, Faces, and Places will be happy to know that all of that work will flow effortlessly into Aperture 3 when you use the Import iPhoto Library approach. Events and Albums Your Events from iPhoto are converted to Projects, and placed inside a larger folder called Events in Aperture. Albums remain Albums, as do Smart Albums which come over intact. If you have Book Projects in iPhoto, those are converted into regular Albums in Aperture. Faces In my tests, the Faces corkboard in Aperture 3 mirrored my corkboard in iPhoto '09 after import. The biggest difference is that Aperture enlarges the Faces thumbnail photo more than iPhoto. You have an option in Aperture to turn off the corkboard background if you don't like it. Go to Preferences -> Appearance and uncheck the box next to "Show corkboard background for Faces." As in iPhoto, if you want to change which image is used for the thumbnail on the corkboard, just scrub through the images by mousing over them, then hit the Spacebar for the shot you want and it will become the thumbnail. Unlike iPhoto, holding down the Option key doesn't show you the full image on the Faces corkboard; you have to first double-click on the corkboard photo, then click on the Photos button at the bottom of the Aperture interface. Most of the other functions behave similarly to iPhoto. Places I was also happy to see that all of my Places information from iPhoto '09 appeared in my Aperture 3 library after import. 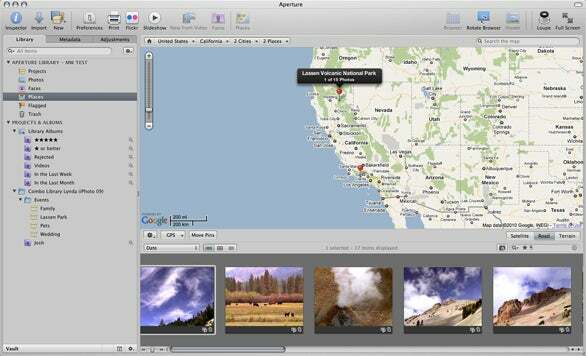 Aperture even streamlines the interface by combining the Map and List views into one view with a navigation bar on top, a map in the middle, and thumbnails at the bottom. You can grab individual images from iPhoto, or even entire Events, by going to File -> Import -> Show iPhoto Browser. You'll be greeted with a browser interface that shows your iPhoto Library hierarchy on top, and the Events below. Navigate to the image or group of images you want, then drag them into the Aperture Library Inspector. If you bring an entire Event over, Aperture will create an Untitled Project and put the Event in it, with the added bonus of creating an album with the Event name. This method is simple, but your Faces information won't be transferred. Plus, you don't have options for setting up a referenced library since all of the files are moved into the Aperture library. This method is better for bringing in a handful of images instead of an entire collection.